My girlfriend and I recently moved out of our one-bedroom apartment into a house and as a result we have more space. Boxes that have been stored in my parents’ garage for decades have duly been delivered. That includes the cream of TRS-80 press in the eighties, 80-Micro. At the dawn of the personal computer, the TRS-80 was a big deal. It was the first complete computer system, launched in 1977 at a comparatively low price1. 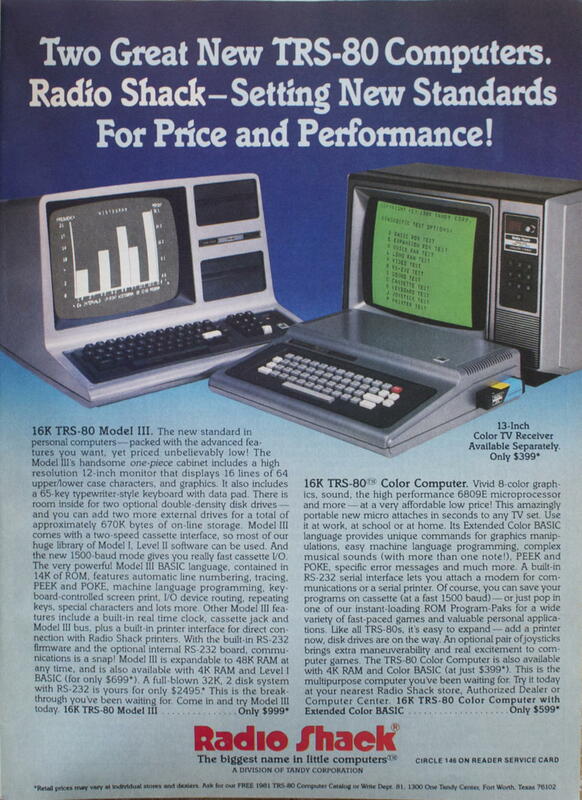 The TRS-80 held 70% of the market in 1977, and Radio Shack maintained their market lead through 1980. Around 1983-1984, however, people started to get worried about the apparent decline of TRS-80 market share. Radio Shack’s personal computing stars were old—the Z80 line of the Model I/III/IV, and the Color Computers 1/22. Their only remaining hit was the Model 100, a real and useful portable before “laptop” was even a common term3 but still not something you’d replace your desktop with. At the start of the personal computer revolution, this helped them: the BASIC tutorial that came with the TRS-80 Model I was head and shoulders above everything else, teaching new users in a breezy, easy-to-read style how to write their own BASIC software to perform the tasks they’d bought their computer for. By 1986, however, when they introduced the Color Computer 3, people didn’t expect to have to write their own software. But the CoCo 3—two years after the Macintosh—was still a command-line-based, BASIC-oriented personal computer. Tandy sold, as an add-on to the Coco, OS-9, a fully-multitasking, real-time, multi-user operating system with dynamically loaded modules and a separation of code and data that made it possible for different user software to access common system subroutines. Besides saving memory when multiple software packages were running at the same time, this made a GUI with common user elements possible as well. OS-9 was so impressive, and so useful, that for a year or two after I sold my CoCo 3 in April 1992 I didn’t own any computer at all. The inability to switch to new software in less than a second via a single keystroke was too frustrating. It wasn’t until I wanted to start writing again that I picked up a used Windows 3.1 PC in about 1993. I did very little programming on it or anything except writing, because it was so frustrating to use, compared to what I was used to. It wasn’t until I picked up a Macintosh in 1994 for web serving that I began to get back into using the personal computer as a general purpose product. This wasn’t because the Macintosh matched the functionality I missed in OS-9, but because it provided more functionality to make up for it. My concept of EM runs something like this: The time is well on its way when a microcomputer/terminal will be on most business desks and in most homes. 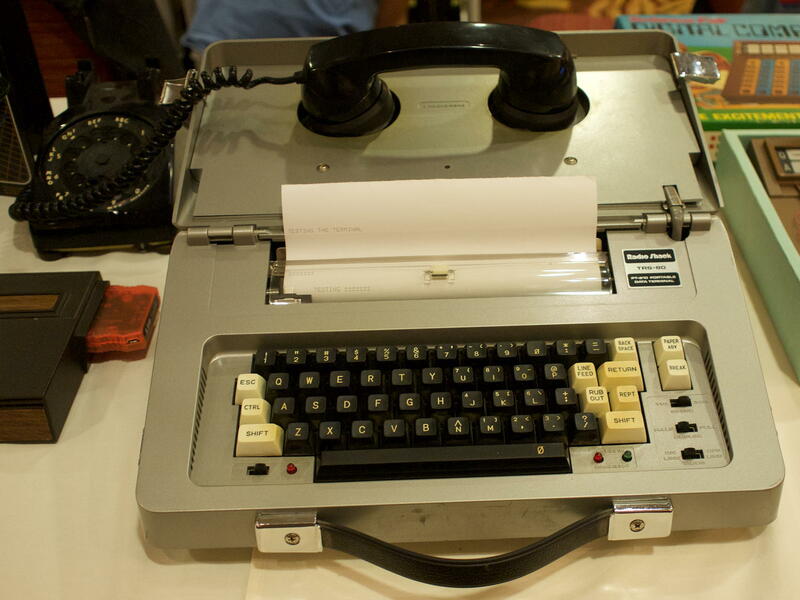 I’ll be able to type in a message, using the telephone number as an address. This message will then be sent to the addressee via telephone lines almost immediately. My system will dial the number and if it’s busy, it will continue to check the number every minute or so. When the line is free, the system will send a tone that prevents the phone from ringing on the other end and actuates the EM unit. After the system receives a handshake signal, tell the other unit how many bits of information are forthcoming, send the message, await an okay, and hang both up. Time, at 1200 baud, perhaps one minute. The EM unit on the other end will have a light indicating an awaiting message. This can be read when convenient and a response made… all within a minute or two, if needed. On the one hand, I could make fun of him for thinking, pre-Internet, that email would be like everyone having a bulletin board system. On the other, this is a damn cool setup. BBSs already existed in 1980, though they were far from their mid-90s peak; it is interesting that his vision was not a store-and-forward system using BBSs. Everyone knew the home and office phone numbers of their friends and colleagues; everyone did not know person@BBS. And, of course, his vision also emulates the answering machine of the time, but merges them with FAX systems1 so that neither the caller nor the sender need to be at the telephone to communicate. His vision was asynchronous. Unlike synchronous tasks such as going to the Post Office or the DMV, asynchronism vastly speeds up communication. Because, as he noted, neither the sender nor the receiver have to coordinate anything. In August, 1981, IBM introduced the IBM Personal Computer, and begin shipping it in October. At the time, the market was dominated by Tandy (Radio Shack), Apple, and Commodore. I’ve been rebrowsing 80 microcomputing, and in the November 1981 issue Betty Thayer covered the introduction and Tandy’s reaction to it. Thus far Tandy’s reaction to their new competition has been blase. “I don’t think we’re going to lose any business because of it,” says Jon Shirley, vice president of the Fort Worth, TX, firm’s computer division. What’s amazing is not just how clueless Tandy leadership was, but also that experts in general were all over the map. The article itself tends to focus on the small business market, rather than the personal computer market. These new machines “will not have an immediate effect,” says market analyst Al Hirsh of Datapro Research Corp., Delran, NJ. Hirsh feels that the new computers will have the swiftest impact on Tandy’s major accounts because their competitors have so many business contacts. Other marketing people think the new computers—particularly the IBM personal computer—will affect Apple computer’s sales more than Tandy’s. “The IBM personal computer is aimed smack at Apple, “because its price and capabilities are similar,” says Gerald Hallaren of the Yankee Group, a Cambridge, MA, market consulting firm. The very title of the article shows off the confusion: Xerox, IBM storm market, pull wraps off their micros. Hirsch predicted of the IBM offering that “One million of them will be sold by 1985”. In fact, they hit a million sometime in 1982, and sold another million in 1983, another two million in 1984. By 1985 they were selling five million per year. Radio Shack had their own sales outlets; the other computers of the time, including IBM, sold through third-party outlets such as Sears and ComputerLand. How will Tandy’s distribution match up? With 2,000 dealers, 168 computer centers and 4,800 retail stores, they’ve pretty much got the field covered. They also have some direct accounts sales people, though this is certainly not their strongest point. Shirley of Tandy thinks their retail units are the key to escaping the influx of IBM and Xerox. “They’re selling them in stores where they sell Apples and PETs,” he says, theorizing those two producers will feel the brunt of the competition. By 2000 A.D., videotext terminals will cost as little as $50, according to a study by the Institute for the Future, a California research and consulting group. The concern also predicted 10 percent of the homes in the United States will have terminals by 1990—when the devices will sell for $200—and 40 percent by the end of the century. According to the computer newspaper Infoworld, figures on videotext compiled at the end of 1981 reveal 42,000 U.S. and Canadian terminals were subscribing to Dow Jones, The Source and CompuServe; 150,000 U.K. terminals were receiving one-way CEEfax and Oracle teletext; and 10,500 terminals were interactive with 500 electronic publishers and 500 users in seven countries over Prestel’s international service. This was not in the April Fools section, nor is it a simple change in terminology. In 1981, the “videotext terminal” was specifically a dumb terminal used for interacting with subscription services—and there were people who still thought the dumb terminal with network (dial-up, at the time) connectivity would be the mainstream version of the personal computer. Going through my old creative computing magazines, I ran across this ad from Radio Shack, highlighting both the TRS-80 Model III and the TRS-80 Color Computer, both introduced in 1980. The Model III screen is pretty standard for ads of the time, showing off its use as a business computer. The CoCo screen, not so much. The “Vivid 8-color graphics” are represented as a green screen with black text. And take a close look at that black text. The software they’re advertising isn’t a game, or business charts, or even colorful word processing. It’s the diagnostics cartridge. I’m pretty sure that cartridge did not even come with the computer. Other computer companies advertised by showing—besides games, charts, and word processing—programming code, mathematical analysis, and even rudimentary paintings. What market was Radio Shack targeting with diagnostics text? That same cartridge also contained Chess, Checkers, a game called Quasar Commander, and Personal Finance software. Any of those would have been a better choice for an advertisement. I only have five issues of creative computing, all from 1981; the January issue had a review of the Color Computer, and is the only issue in which I could find an ad for it. There was another ad in August for the TRS-80 Model III only, advertising it for classroom use. The Apple II, which launched earlier in 1977, did not have a monitor, and sold for $1,298, compared to the TRS-80’s $599; Radio Shack’s real competition was not the Apple but the Atari 400/800 and later, I suspect, the Commodore. Both the Color Computer 1 and 2 ran at the same speed. The faster CoCo 3 wasn’t available until 1986. 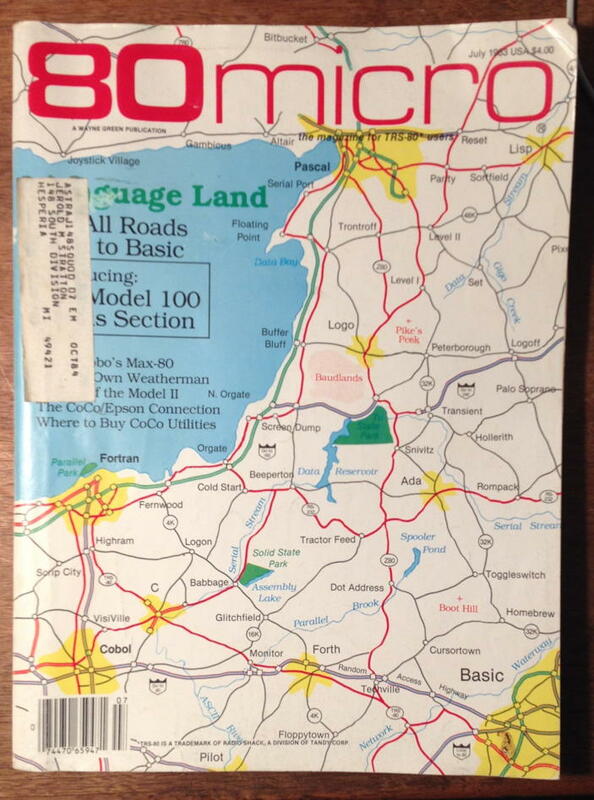 You can read about the Model 100’s introduction in the July 1983 issue of 80-Micro. Eric Maloney, 80-Micro, November 1983, p. 6. The Model 4D was “available” until about 1994 and the CoCo 3 until about 1991. However, I worked at a Radio Shack store in 1988, and, at least in Hollywood, only the CoCo 3 was on display and it was not something we steered customers toward. I don’t think anyone bought one from us the entire several months I was there. Eric Maloney, 80-Micro, June 1984, p. 8. 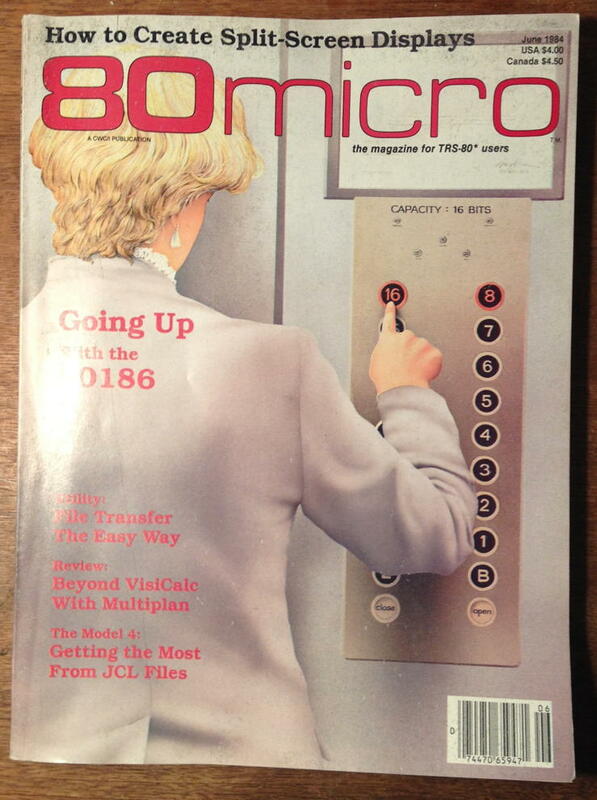 80-Micro’s fate was tied to the TRS-80: the July 1983 issue was 386 pages; the June 1984 issue 242, and falling. A collection of documents related to the TRS-80 Model 1, including David Lien’s excellent Level 1 BASIC tutorial. One of the hallmarks of good science fiction is not just envisioning future technologies, but also the effects of the technology on everyday life. In November, 1981, Wayne Green looked into the usefulness of the secretary in the age of the personal computer. This Radio Shack ad, from the January 1981 creative computing is a good example of their strange ideas about what would sell. 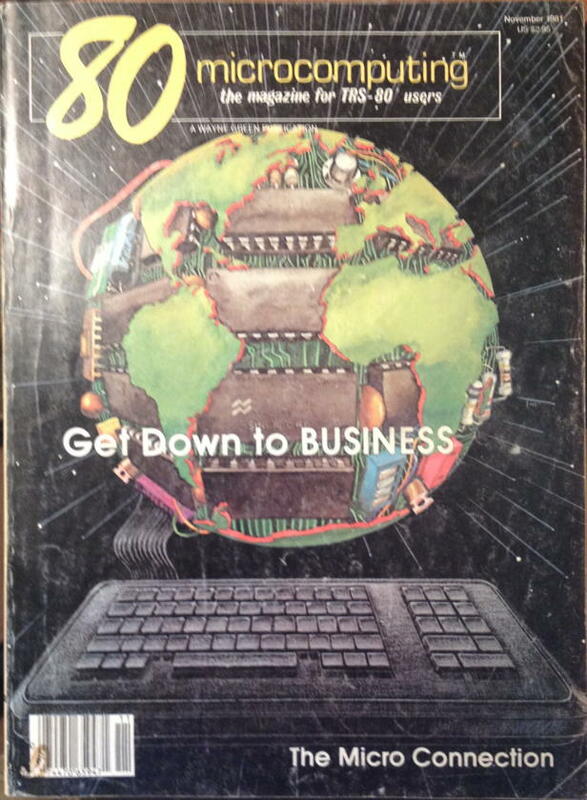 In 1980, after I bought a personal computer, I wrote a simple computer program in BASIC and sold it to one of the many magazines at the time. To the second-major newspaper of the area, this was a big deal. really interesting, I have been going thru gleaning programs and other usefull stuff. the C-Notes in 80 Micros are a good read. 80-Micro and the TRS-80, 1983-1984 last modified February 15th, 2019.